The Silk Road Project is an internationally minded performing arts nonprofit with cultural and educational missions to promote innovation and learning through the arts. Cellist Yo-Yo Ma founded the Project in 1998 taking inspiration from the historical Silk Road trading routes and using the Silk Road as a modern metaphor for sharing and learning across cultures, art forms and disciplines. 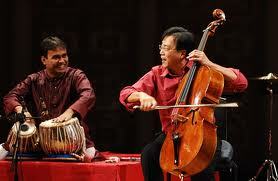 Listening to this group perform was unlike any classical or world music concert I’ve ever heard. Imagine a collection of instruments ranging from western cellos and violas to a kamancheh (Persian spike fiddle), oud (Middle eastern fretless lute), and cheng (Chinese mouth organ). You can look at the instrument collection here. Then imagine the audience, filling a formal hall to capacity, rhythmically clapping while the musicians played with the energy to rival any rock band. It was amazing. And it made me think again about the research suggesting that multicultural experiences can enhance creative thinking. Most of the time we think about cross-cultural experiences as something we either do or don’t do, not necessarily something we actively set out to create. And yet, that is what Director Ma did in establishing the Silk Road Project. He set out intentionally to bridge musical gaps and bring differing traditions together, just to see what they could build. What would happen if we tried to do some of that in schools—not just expose students to various cultures (though that is a great place to start) but actively work to help students synthesize some of the things they learn about new cultures with their own traditions? It may be easiest to begin in the arts. If studying a different culture (either outside your country, or a subculture within it), are there instruments you could add to those already available in your school? What new sounds could they add to familiar tunes—or how might you adapt familiar tunes to better suit new sounds? What would happen if students studied visual art forms outside their own culture and then, rather than trying to imitate them, envisioned what would happen if they synthesized that tradition with one that is more familiar? Where else could such syntheses emerge? Certainly fusion foods have brought interesting flavors to restaurants across the world. I’m sure there are many more options. Cultural synthesize both requires creativity and energizes it. What could you do to join the effort? To be inspired, take a look. If you want more, just explore the Silk Road collection. PS The Silk Road Project offers a variety of curriculum and arts integration resources. While some require attending their workshops, others can be found online.